If you've driven through Deptford, you've probably noticed the balloons. Not that the place looks like a birthday party, but the welcome signs and even the town's water tower are bedecked with illustrations of hot air balloons. The colorful decor isn't just a cheerful way of reminding you where you are. It's a reference to the first manned air flight in the United States, which concluded in an out-of-the-way spot along Big Timber Creek. Put the two together and you've got the basis of the story: the first time any human flew in America was in a hot air balloon, and it landed in Deptford. Here's the story: a French balloonist named Jean Pierre Blanchard had been touring Europe, demonstrating hydrogen gas balloon flights, when he decided to bring the technology to the United States. On January 9, 1793, he lifted off from the yard of Philadelphia's Walnut Street Jail with the goal of crossing the Delaware into New Jersey. Among the spectators at his departure were President George Washington, Vice President John Adams and Thomas Jefferson. Less than an hour later, Blanchard and his balloon landed on the banks of Big Walnut Creek. Some contend that the voyage inadvertently carried the nation's first airmail, too. 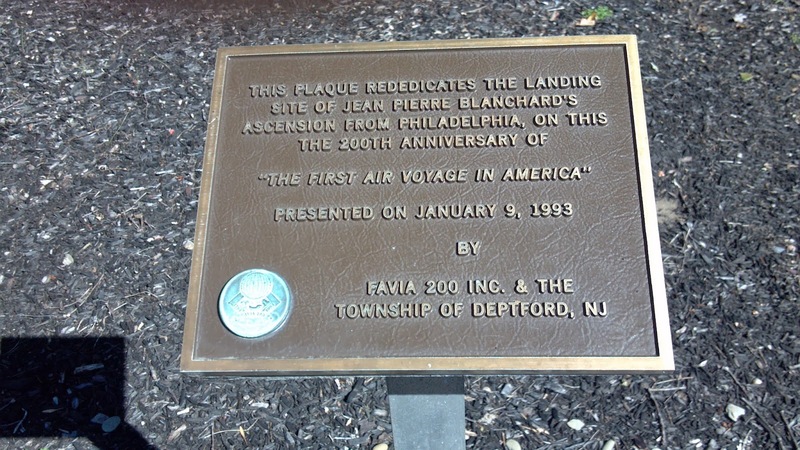 Before he left Philadelphia, Blanchard secured a letter of introduction from President Washington, for use in the event the balloon's descent caused any problems with angry or suspicious property owners. I've known the story for quite some time, but the actual landing spot eluded me until recently, when Triton Regional High School students Katie Field and Stephanie Espinal clued me in. "You know where the Walmart is?" they asked me. Oh, boy. This is even better than the time the guy at the Greenwood Lake Airport sent me to the West Milford A&P to find the story of the first rocket-propelled air mail delivery. With their instructions in hand, I made my way down Clements Bridge Road to what looks like a brand-spanking new Super Walmart. 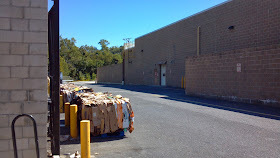 Rather than parking up front, I followed the truck route toward the back of the building, where the shipping docks are. The students had told me that there's a commemorative marker beyond the perimeter fence, and that there's a trail that brings you right to the site. No need to track through brush and brambles -- it's totally visible from behind a cinderblock wall. I saw no sign of the marker as I slowly drove the perimeter of the lot, so I pulled over and explored on foot. Just as I'd been told, the trail starts behind a wall, and there's an opening in the fencing to allow you in. 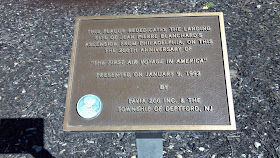 What I found was a marker placed on the 200th anniversary of Blanchard's flight, a boulder that appears to have once held a commemorative plaque, and big old oak tree. I figured that the missing boulder plaque had told the balloon story, but research proved me wrong. The tree, as it turns out, is notable in its own right. 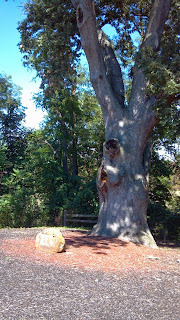 Known as the Clement Oak for the family who once owned the land, it's said to have been a landmark to the Lenape before the arrival of the Europeans. Like the Salem Oak farther south, the 400+ year old Clement Oak reportedly sheltered natives and white men as they negotiated terms of settlement. It also served as a reference point on early land surveys, leading historians to believe that it was held in regard even in the earliest days of European settlement. The Gloucester County Historical Society honored the white oak during the state Tercentenary celebration in 1964, lauding it as a symbol of New Jersey's continuous growth. Today, it's estimated to be 18 feet tall, with a trunk girth of more than 19 feet and an overall spread of more than 100 feet. To my eyes, it appears quite healthy, maybe even healthier than its cousin in Salem. Who knew you could find so much behind a big box store?